Iconic British potters Denby have teamed up with Woman & Home to offer two lucky winners the chance to win a set of unique Studio Craft tableware. 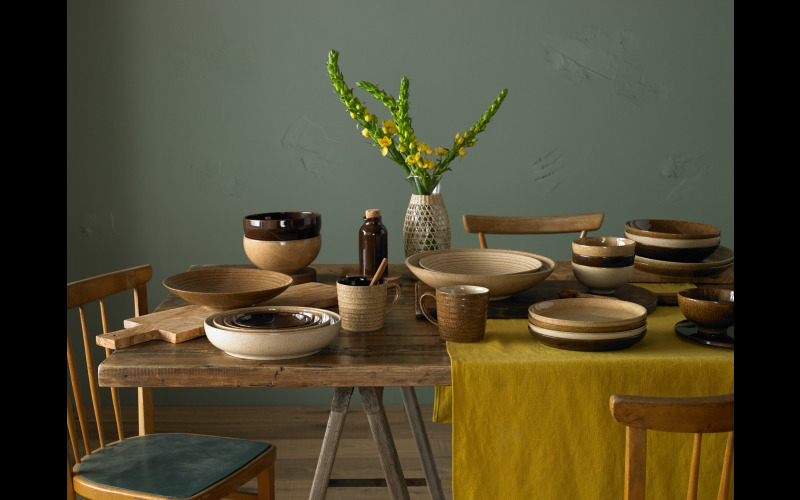 Inspired by nature and the continuing trend for an honest and rustic aesthetic at home, Denby’s hand-crafted ceramics collection, Studio Craft, has been designed by artisans using skills perfected at the pottery over 200 years. Studio Craft combines four tonal glazes in rich, earthy hues and takes influence from the soft, natural tones and raw textures of nature. Available in both smooth and ridged textures, in woody colourways of Elm, Birch, Walnut and Chestnut, pieces can be added to existing tableware in the home or stacked together for a contemporary yet natural look. The collection reflects modern life at home, with bowls, plates and platters in all shapes and sizes, perfect for weekday dinners as well as laid-back entertaining. Plus, thanks to its strong Derbyshire clay Studio Craft has all the qualities and functionalities of Denby’s quality stoneware with durable pieces that can be used straight from the oven or microwave and in the dishwasher too. The prize includes a selection of Denby Studio Craft pieces worth over £250, ideal for stylish entertaining with friends and family. For more info visit www.denbypottery.com and follow @DenbyPottery on Twitter, Facebook and Instagram.